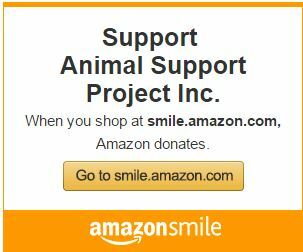 The Animal Support Project » Legislative Corner – What is Animal Cruelty? TASP gets our share of calls from folks concerned about this or that animal’s welfare in their neighborhood. Whether it’s a neighbor’s dog tied out in weather extremes, or dairy heifers with hip bones protruding in springtime, it’s commendable that people care enough about animals to seek help on their behalf. Sometimes what they’re seeing is actually not cruelty, according to NY State law, and sometimes it is. In the previous TASP newsletter, we talked about how to make change happen at the federal level. I thought it might be a good idea to take it back a notch and talk about state level matters, especially concerning animal cruelty. Look carefully at the big and small picture and compare what you see to Article 26 of the NY State Agriculture and Markets Law. Remember, not everything that looks like cruelty is legally cruel under our existing laws. In this state, animals are still considered the property of their owners, just like a car or a ladder. Companion animals have a bit more protection under Article 26, but even at that, the protections are in some cases vaguely worded and up to the interpretation of officers, attorneys and judges. Not all cruelty or neglect is intentional and not all cases of neglect are considered by law enforcement to be prudent to prosecute, from a resource-availability perspective. An elderly pet owner who isn’t able to trim their pet’s nails or whose dog/cat’s fur is matted isn’t necessarily intending to hurt their pet. On the contrary, they may be distressed, embarrassed and/or ashamed that they aren’t able financially or physically to keep up with the animal’s care. It may be their only companion and so they may be reluctant to let it go. There may be no relatives or neighbors nearby who can/will help them with the tasks, or they may not understand the physical discomfort that long nails or matted fur can cause an animal. The owner’s arthritis, poor eyesight, lack of resources or the onset of their or their loved one’s illness may also be legitimate reasons for a lapse in a pet’s care. Swooping in to judge/accuse/publicly shame the owner in such cases without knowing the backstory adds to the tragedy instead of helping overcome the issue for the long term. 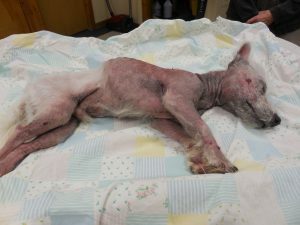 Those are the cases where TASP might be able to help by paying for grooming or vetting for that pet. Or, if the situation is a sinking ship, TASP may even offer to help the owner place the pet in a more secure home so the owner can move on to assisted living. But before you set us on that pet owner, why not drop by with a cup of coffee, a little tray of cookies or some animal-related trinket that shows you care, so you can get acquainted and learn more about why your neighbor’s animal looks the way it does and how we outsiders might be trusted as worthy to help? I actually had a very nice lady call me once with great concern about abused dairy cattle on a farm near where she lived. It was spring and she said she was seeing the female cattle standing outside with hip bones protruding. She said they looked starved and were all muddy and she was sure they were being horribly neglected. She didn’t stop in to talk with the farmer and she didn’t research on the internet to learn more about how to judge a cow’s body condition score. She just drove past the farm day after day on her way to and from work and with each pass, she got herself more and more worried about these poor cows. When she called me to talk about it, I assured her I would take a look, but that these cows were probably fine, given it was calving season. I gave her a brief rundown in what makes cows look the way they do so she could understand why what she was seeing might be expected at this time of year. And when I drove over to take a peek, my hunch was confirmed; there was no shortage of food available to those cows and they were happily chewing cud when I got there. This lady was a very well meaning person unfamiliar with dairy farming. She was judging the appearance of these cattle against the condition of her pet dog and saw a disturbing contrast. But those familiar with dairy farming will tell you the cow’s physical structure is far different from any dog’s (let’s start with just the number of stomachs for an example) and a heifer’s body condition fluctuates with the time of year and her calving/lactating cycle. As it turns out, these cows were in fine condition; they had just been calving and that takes alot out of the system so the Moms all naturally looked a little droopy around the hip bones at that time. There was no law broken here. So here’s a test for you…. a couple of photos of a suffering dog. 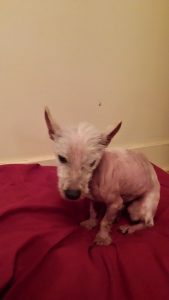 Is it a case of animal cruelty/criminal neglect? Answer: Not. This dog had a loving owner who spent thousands of dollars in her attempt to overcome her dog’s allergies. She trusted her veterinarian to diagnose and treat this dog, but unfortunately, this particular vet was having difficulty getting a grip on the case. The stack of invoices and reports in this little guy’s vet history attested to a year’s worth of repeated trips to the vet, each time with a new proposed treatment that was supposed to stop the tormenting itch. By this time, the dog had ulcers from too many steroids, an antibiotic-resistant staph infection from too may antibiotics and he was half his normal weight. 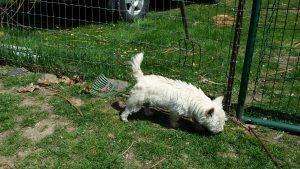 At the recommendation of her vet, his owner was about to euthanize the 2 year old West Highland Terrier when she reached out to her coworker who reached out to TASP. We had the dog properly diagnosed and treated by another vet with more experience in helping animals with severe allergies. The dog’s Mom gratefully surrendered him to TASP because she didn’t feel equipped to deal with the care he would need going forward. He’ll always need allergy shots and carefully controlled diet and environment, but here’s a recent photo of Spencer …..he actually needs regular haircuts now! First, do NOT change the condition of any of the animals on that property. Don’t groom the matted one, don’t trim the nails or make any improvements to the suffering animals. Sound cruel? Wellllll, if you change the condition of any of the suffering animals before they can be witnessed and professionally documented by a vet/officer, you’ve changed the evidence of the crime. Instead, start documenting the cruelty you suspect. In a perfect world, this would entail taking photos or video of the situation. But the important thing you need to know is, you aren’t legally allowed to step onto the property of others of whom you suspect cruelty without their inviting you to do so. This reality may be the factor that determines you aren’t able to gather images of the animal you think is suffering. If that’s the case, write down the dates and times when you witness cruelty occurring and write detailed descriptions of the incident: what kind and how many animals and how are they being abused? What evidence are you seeing? Be specific. Try to match up what you’re seeing with the actual section and subsection of Article 26 that applies. List any other witnesses present and try to be objective in your description. These notes may be reviewed by law enforcement and may eventually be considered evidence in a trial if the case gets that far. With your evidence in hand, call 911 or visit the local police department and report the suspected cruelty. You need to file an official complaint with the local police, and you may need to insist that they take your complaint, depending on how animal-friendly the officer on duty is. After that, the case will be reviewed and an officer may visit the suspect’s home, or they may send the dog control officer (if it’s a dog that you are concerned about) to see if they see any evidence of a cruelty issue. Don’t be surprised if the officer/DCO points out to the suspect that they are in violation of one or more sections of Article 26, and offers the suspect an opportunity to correct the situation. This is akin to an officer offering you a warning instead of a citation for speeding in your car…..and based on what the officer learns when visiting the suspect, he or she may feel it makes good sense to give the suspect a chance to get things back under control over a given period of time instead of immediately drawing them into the criminal justice system. Now, some people may say, “How can you equate suspected animal cruelty with my innocent speeding violation?” The answer is, your vehicle weighs ALOT, and when it’s going faster than recommended, the chance of your imposing cruelty on an innocent animal/human who happens to be in the wrong place at the wrong time is actually quite high. That’s one reason why we have speeding laws. But if an officer looks you in the eye, communicates with you, looks around your vehicle, checks your past record and feels you would change your behavior after a warning, then they’re entitled to make that judgement and give you the opportunity to self-correct. This saves valuable police and court resources for the really heinous cases that absolutely require immediate prosecution: the person who lights the stray cat on fire, the person who beats a pet to death with a shovel, the person who slashes their neighbor’s pet horse in its stall, or the person who blatantly refuses or is unable to heed the warning of an officer who has already given them official warning of their violation. The New York State Humane Association wrote the book on investigating animal cruelty. Literally. CLICK HERE to read their indepth procedural layout for animal cruelty investigators. This is the book by which many police departments learn how to investigate Animal Cruelty, so in becoming familiar with this manual, you can help your officers do the best job of bringing an animal abuser to justice with a case that isn’t likely to be thrown out of court. We’re a nation of laws. They’re certainly not all perfect but they’re part of a system that attempts to provide at least a bare minimum of protection for the vulnerable. The tricky part of all this from the perspective of law enforcement is protecting the rights of animals without violating the rights of humans. As animal lovers, it’s easy for us to confuse our own standards of care for our pets with what is legally required. This is one of the root causes of misunderstandings and polarization among the community. By becoming more educated ourselves about the legal side of animal welfare, we can help law enforcement do a better job and we can also offer our law makers concrete suggestions for new bills that can update and improve laws. And that’s how we can make our community a better place for all species.